When Tufts University Trustee Bernard Gordon lived in Tufts’ West Hall in 1944 during his officer training for the Navy, he bunked four to a room. 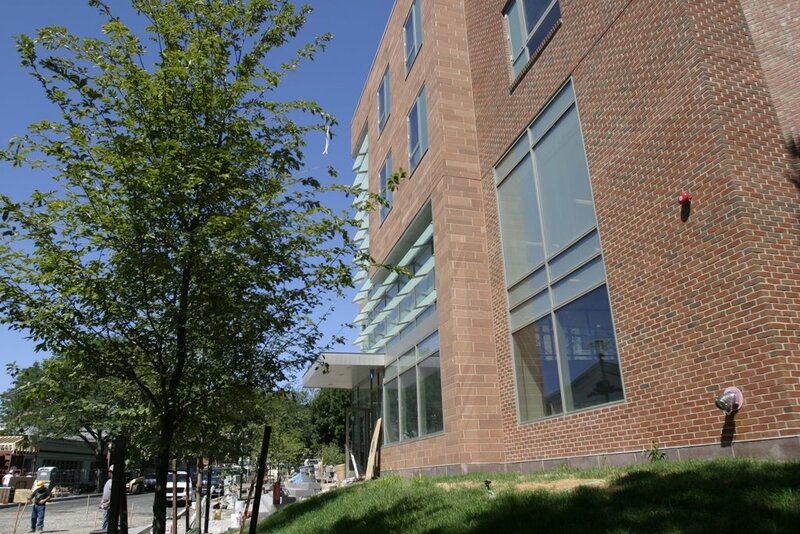 This September 3rd, when students at the Medford, MA university move into the new Sophia Gordon Hall, named in honor of Bernard Gordon’s wife, they will live four to a suite in a “green” dorm with single bedrooms, fully-equipped kitchens and bathrooms, and a host of environmentally-friendly features such as hot water heated by solar panels on the roof. A $10 million gift from technology pioneer Gordon made the construction of Sophia Gordon Hall possible. The new 126-bed dormitory will house fourth-year students and is Tufts’ first “green” building. Sophia Gordon Hall is expected to use 30% less energy and 30% less water than would a conventionally designed building. The bathrooms include motion sensors that will turn lights off when not in use and a dual-flush toilet. 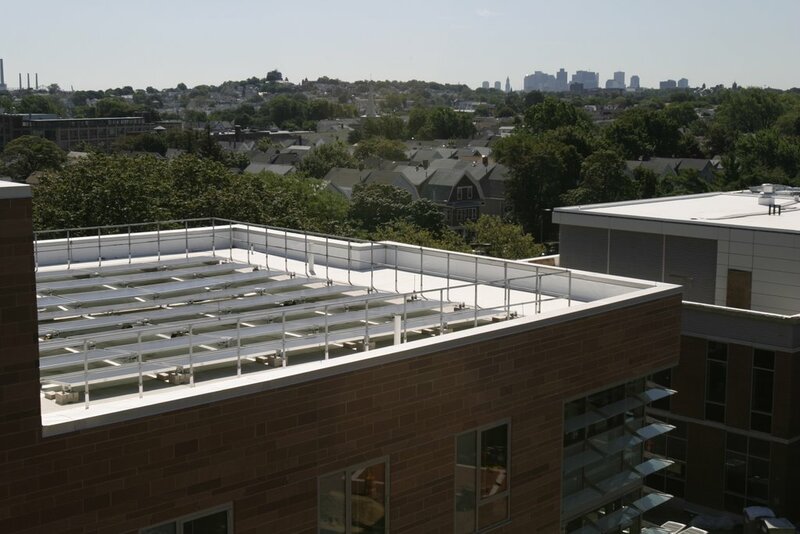 Rooftop solar thermal and photovoltaic arrays, funded by a grant from the Massachusetts Technology Collaborative with matching funds from Tufts, will help heat water and will generate supplemental power for the building. Most corner windows include louvered glass that will reflect heat away from the walls in the summer months and reflect heat indoors during the winter. Suite living rooms include many windows, as does the multi-purpose room, to reduce the need for artificial lighting during the day. The majority of the building’s flooring is made from recycled material or renewable resources, including the hallway and suite carpeting, the rubber flooring in stairwells and the bamboo wood floor in the multi-purpose room. In addition, the steel used to build the residence hall is more than 85% recycled. Sophia Gordon Hall was designed and built to the U.S. Green Building Council’s LEED (Leadership in Energy and Environmental Design) Green Building Rating System. The building is expected to receive a LEED silver certification. “The LEED process brings everyone together, from the building owner to the designer to the builder,” said Randy Wilmot, project associate with William Rawn Associates, the building’s Boston-based architect, “and it encourages creativity and innovation from all parties.” The 62,000-square-foot residence hall was built by Linbeck of Lexington, MA. Tufts is committed to meeting or exceeding the Kyoto Protocol for reducing emissions that contribute to climate change and is a member of the Chicago Climate Exchange. In 2005, Tufts and the Tufts Climate Initiative won the EPA Climate Protection Award. The University will host a dedication ceremony for the new residence hall on September 6. New LEED Requirements For Student Housing Shift ResponsibilityNew LEED v4 requirements for student housing require new training and a shift in the behaviors of students, residence life staff, maintenance, and housekeeping staff. Next articleWEB EXCLUSIVE: Should your plant rely on 250-year old lightning rod technology?